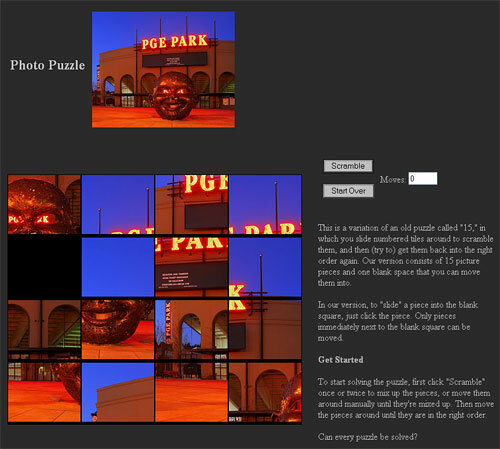 This Photoshop action helps you create interactive puzzles from your images. This is what the classic "15" puzzle looked like. It was made of wood or plastic, and you slid numbered tiles around to scramble them, and then tried to get them back into the right order again. 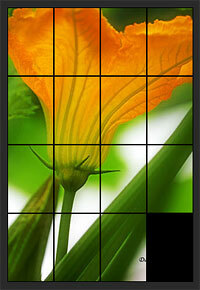 The puzzle you'll create is a variation of this, using your images instead of numbers. Your version will consist of 15 picture pieces and one blank space that you can move them into by clicking them with your mouse. The action will cut a copy of your image into puzzle pieces and generate a small copy of your image to view for reference while you are solving your puzzle. You will also receive a web page that will display your puzzle, scripts to make it work, and a stylesheet which you can edit if you want to change the default colors of the web page. And if you're into editing web pages, you can make any changes you want. 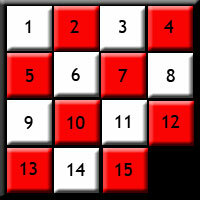 You can work the puzzle on your computer, or upload it to your website. You can create as many puzzles as you want, using a different image each time. Here's a screenshot of the default web page that will display your working puzzle. The top of the page displays a small copy of your image to use for reference as you solve the puzzle. The bottom area shows the puzzle, which you would solve by clicking on the squares next to the empty (black) square.